You’ve taken a wrong turn in the depth of the jungle and now you’re on the run from a crazy tribe of cannibals. Click here to play! Navigate the thick landscape to escape. If you’re successful, you’ll spin in plenty of big wins. If not, you’ll become dinner. Keep your eyes peeled for the wacky tribesmen as these jungle goers are lurking around every corner. They’re substitutes that will replace other symbols to help you bring in the wins. They will also bring in up to 10,000 coins if you can spin one or more across an active payline. You’ll also want to keep an eye out for other captured explorers. These potted scientists will bring in a maximum of 900 coins if you can spin two or more across a payline. There are also monkeys, jungle jewelry, ladles and many more to help you make your way through this game. You might be lucky enough to capture some of the tribes’ treasure in the form of golden, gemmed masks. These symbols act as scatters that will multiply your total bet. They will also reward a number of free spins. 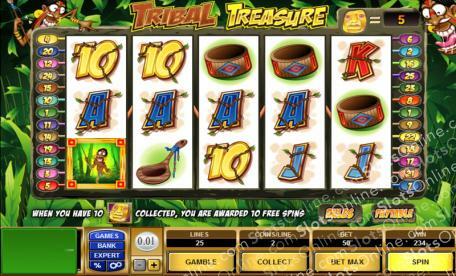 See if you can escape the clutches of the crazy cannibal tribe in this online slot for a chance to bring in plenty of hidden jungle treasure. The golden tribal mask is a scatter. It will multiply your total bet if it appears on the board. It only appears on reel 3, but collect 10 of them to trigger a free spin bonus feature. The Native is a substitute. He will replace all others except scatters to help create more winning combinations. It will also payout a maximum of 10,000 coins.